Five individuals are being inducted into Southwestern Oklahoma State University’s Distinguished Alumni Hall of Fame during 2017 graduation ceremonies on the Weatherford campus. They include our own Joey Martin, Class of 1988 and 1991, who serves as associate dean for the College of Fine Arts & Communication, director of choral activities, and professor of music at Texas State. The 2017 inductees will be honored by SWOSU President Dr. Randy L. Beutler at a May 6 Convocation. This entry was posted in alumni students faculty NEWS and tagged SWOSU on February 28, 2017 by Thomas S. Clark. Senior Lecturer Richard Hall’s ambient electronic piece, Rain Delay for three electric guitars and video projection was performed at the 2017 NACUSA Texas Chapter Conference on February 18 at the University of the Incarnate Word in San Antonio. Performers included Richard, graduate student Shawn Jones, and junior music major Francisco De La Rosa. This entry was posted in alumni students faculty NEWS and tagged ambient electronics on February 27, 2017 by Thomas S. Clark. At the recent meeting of the Texas Society for Music Theory, Cynthia Gonzales was elected President-Elect, which will be followed by a three-year term as President and two-year term of Past-President. This entry was posted in alumni students faculty NEWS and tagged Texas Music Theory on February 27, 2017 by Thomas S. Clark. Texas State was well represented in San Antonio for the recent Texas Music Educators Association annual Clinic/Convention. Faculty who performed, presented or presided included Mary Ellen Cavitt, Lynn Brinckmeyer, Amanda Soto, Keith Winking, Jonathan Babcock, John Schmidt, and Teaching Assistant Jack Wilds. Adah Jones, Charles Hurt, Caroline Steiger, Lynn Ledbetter, Ian Davidson, Mary Ellen Cavitt, and Keith Winking judged or led All-State sectionals. Lynn Ledbetter received the Phyllis Young Outstanding Studio Teacher from the Texas Chapter of the American String Teachers Association. Todd Oxford, Martin McCain, and Jack Wilds were endorsers at company exhibit booths. The School of Music’s booth looked fantastic and got tremendous attention and traffic, with major staffing by Krystyn Jensen and Al Corley. The Alumni Reunion hosted by Director Thomas Clark was a fun party. Kudos to Krystyn Jensen who organized these two major components of our presence at TMEA. By all measures, TMEA was a huge success for Texas State School of Music. This entry was posted in alumni students faculty NEWS and tagged TMEA on February 21, 2017 by Thomas S. Clark. The first-ever Texas State University Alumni Trombone Choir performed at the 2017 Texas State Trombone Symposium in the Texas State Performing Arts Center. Organized by Jeremiah Ward (BM ’13), former students gathered to rehearse and perform pieces that they enjoyed during their time in the Texas State Trombone Choir and Hill Country Jazz Bones. These members are now band directors, private lesson instructors, free-lance musicians, web developers, and hold positions in the premiere military ensembles in Washington DC. Pictured from left to right: Scott Duncan, Steven Vogel, Kyle Johnson, Adrian Teti, Austin Tran, Jett Walker, Kevin Dugat, Jonah Bahta, Brad Miller, Dr. Martin McCain, Donald Lacy, James Quintero, Courtney Edwards, Jeremiah Ward, Mason Egger, and Payson McCright. This entry was posted in alumni students faculty NEWS and tagged trombone choir on February 21, 2017 by Thomas S. Clark. Mary Ellen Cavitt presented four presentations in Warsaw, Poland to the Association for Music in International Schools in November. This entry was posted in alumni students faculty NEWS on February 15, 2017 by Thomas S. Clark. Richard Hall represented two music projects displayed at Texas State’s recent Health Scholar Showcase. One project he is collaborating on is Thomas Clark’s ORIGAMI Project, planning a series of events providing opportunities to experience music and related visual images designed specifically for serenity and meditation in gallery format in an informal, tranquil environment. Texas State trombone students Ramiro Cortez, Camden Scarborough, and Matthew Flores were accepted and received scholarships to attend the Winter Trombone Workshop held at Ithaca College. The Texas State Trombone Octet, coached by Dr. Martin McCain, performed a featured concert at the recent Big 12 Trombone Conference. The ensemble also performed outreach concerts at Bowie High School and San Marcos High School. The octet is pictured below with New York Philharmonic principal trombonist and Juilliard professor, Joseph Alessi. This entry was posted in alumni students faculty NEWS on February 6, 2017 by Thomas S. Clark. 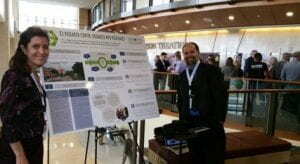 Dr. Martin McCain visited Buffalo State University, Ithaca College, the University of Toronto and the Glenn Gould School. He presented master classes, solo recitals, entrepreneurship talks and coached chamber ensembles. McCain also gave music business lectures at the University of Memphis and Indiana University. He judged the preliminary round of the International Trombone Quartet Competition and was invited again to be a faculty member at the 2017 International Trombone Festival. McCain also hosted the campus visits of Zachary Bond (Malaysian Philharmonic), David Garcia (Zurich Opera) and Max Thein (Thein Brass of Bremen, Germany). 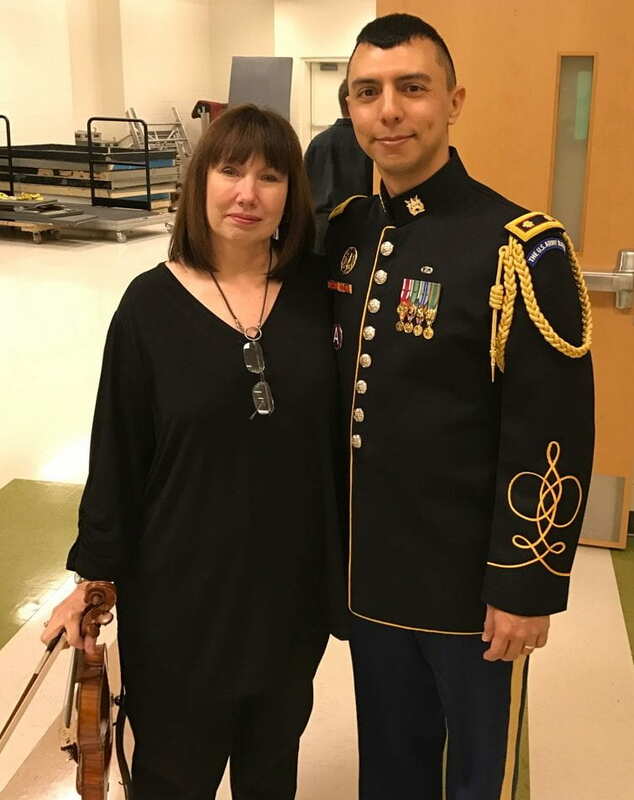 TXST School of Music alumnus Major Leo Peña, Executive Officer, The United States Army Band, and conductor of the U.S. Army Chorus, shared the stage with Texas State Music Professor Lynn Ledbetter and the Arlington Philharmonic in a joint concert January 29 in Arlington, Virginia. This entry was posted in alumni students faculty NEWS and tagged Arlington Philharmonic, Army Band, Army Chorus on February 6, 2017 by Thomas S. Clark.